This pretty balandrine house is located in a quiet area close to the center and the beach. Open the little gate and you will find yourself in a haven of peace. At the entrance, a terrace surrounded with plants. On the 1st floor, 2 bedrooms - including one with a big balcony-, a bathroom and separate toilets. On the canal side, a terrace with a beautiful view on the boats. A 14m x 4,40m mooring. 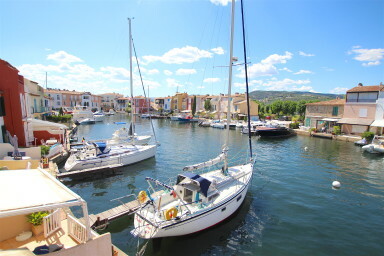 A typical house in the very heart of Port Grimaud.